The official Steam group for the official game, Don't Move, which is officially actually coming to Steam! For reals! Feel free to use this place to discuss the game, provide feedback, or whatever. Be nice! 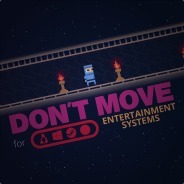 Don't Move is coming soon to Steam! Check out more details in the offiical post and take a gander at the store page. Thanks for your patience! You're the best! Hi! There is an update on the Steam Greenlight page, and you should read it if you'd like, which you might, if you are reading this. any news about dont move and steam or will this never happen? any news here? or can we give up hope? who deleted the comments ? need help, I miss the second and last trophies, someone help ?